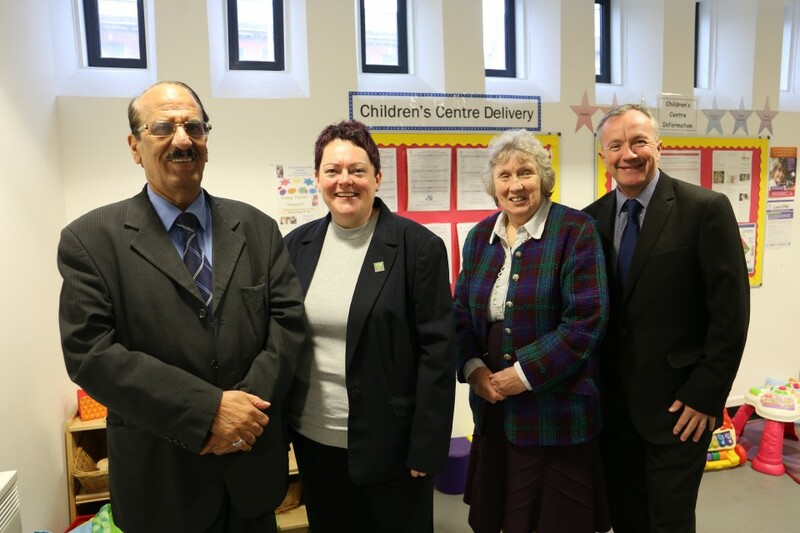 Photo: Council Leader, Councillor Mohammed Khan with Director of Children’s Services Linda Clegg, Councillor Maureen Bateson, Executive Member for Children’s Services and Council Chief Executive Harry Catherall. Blackburn with Darwen Council has been praised for its ‘early help and well co-ordinated support’ by Ofsted inspectors who rated children’s services in the area as good. A team of eight inspectors spent four weeks carrying out a rigorous inspection under the Government’s new Single Inspection Framework. The judgement, published today, December 8, puts the Council in the top third of local authorities nationally and it’s one of only six out of 23 in the North West to have this rating. The network of Children’s Centres and partnership working are highlighted as strengths in the report. Social workers are described as being ‘very committed to helping children and protecting them from harm’. Creative approaches and projects such as the work to protect children at risk of sexual exploitation and missing from home along with the work done to address concerns about radicalisation are also praised. Other good practice was found in the leaving care team with ‘flexible and responsive’ services described. The adoption service was seen to be good with ‘doing the right thing’ for the children being a clear priority. Ofsted separately inspected services for children with disabilities at the Appletree Centre in Blackburn in early October and judged them to be outstanding. The inspectors were concerned about high demand and capacity issues. Recommendations for improvement included making sure arrangement are planned well in advance before they move to adult services. They also offered a number of recommendations in relation to social care practice and procedure to help ensure that there are no unnecessary delays in responding to the needs of children. The judgement really is something special given the unprecedented cuts to the Council’s budget and the increasing demand for our support. More than anything I’m glad that children who most need our help and protection, feel positive about being looked after by the Council. We listen to their views and the inspectors saw that this led to good decisions. I’m also really pleased that our staff and those who work closely with us through our many partnership have got recognition for what they do day in day out. It’s important that we take pride in this report. The inspectors were clear that we have done amazingly well to keep standards high. The quality means we are making a real difference to the lives of children, young people and families. Ofsted reported that people are proud of what they do and where they work here in Blackburn with Darwen. This Council has always prioritised supporting vulnerable people and improving opportunities for young people. This was recognised by Ofsted who commented that both senior political and officer leadership champion the needs of children. The Local Safeguarding Children’s Board was given a good rating with inspectors confirming that ‘it is meeting its statutory responsibilities, with strong governance arrangements that support and promote a strong multi-agency safeguarding culture’. I would like to thank the staff for their continuing efforts as they keep on top of the growing demand and work with increasingly complex cases.